More of a pedestrian shopping zone than a stereotypical suburban "mall," Brooklyn's Fulton Mall draws both budget-and style-conscious Brooklynites, neighboring New Yorkers, and tourists with its array of national brands and independent stores. Centrally located near Brooklyn Heights, both the Manhattan and Brooklyn bridges, and Fort Greene, this walkable street appeals to real estate developers with its high volume of traffic. 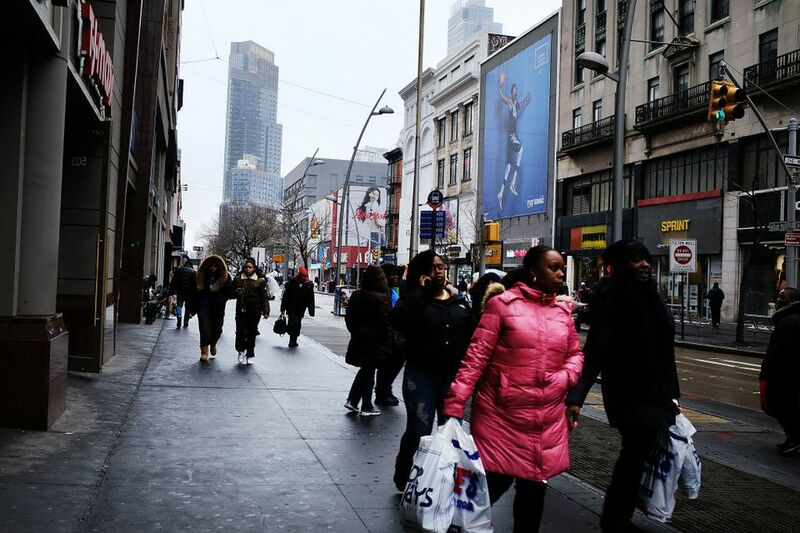 More than 150 retailers operate sales outlets on about eight blocks of Fulton Street. Anchored by Macy's department store, the thoroughfare stretches on an east-west path from the waterfront toward Bedford-Stuyvesant. In addition to shopping, Downtown Brooklyn has events throughout the year including outdoor movies, concert series and pop up beaches. Fulton Mall's storied history began in the earliest days of the 20th century when New Yorkers of all backgrounds donned their best clothing to visit one of the city's busiest shopping districts. The 1980s brought a needed revitalization and a hip-hop vibe to the street. Additional gussying as the 21st century arrived kept the area's commercial character intact, and it remains a favored destination among New Yorkers of all backgrounds for an afternoon of strolling and shopping. The convenient location near several subway lines and a full cast of supporting eateries and bars make Fulton Mall a great place to meet friends and browse for a special something. The Fulton Mall is undergoing a transformation. Many new shops have opened in the last decade including the trendy City Point, which is home to a Century 21, Target, Alamo Draft House, and a large food market. The area also has a growing nightlife with hip bars like the country chic Livingston Manor and Kimono Rooftop Bar with its stunning views and exceptional cocktails. If you want to get discount tickets to Broadway shows, you should stop by the TKTS booth in Downtown Brooklyn near Fulton Mall. In addition to a slew of architectural gems in Downtown Brooklyn, including a historic department store and old theaters, there are multiple places to shop in Fulton Mall. Bargain hunters will enjoy a trip to the Gap and Banana Republic Outlets. They should also stop in T.J Maxx. Fulton Street is also home to numerous chain stores including Foot Locker, American Eagle, Aldo, and many others. However, some of the best shopping and discounts can be found at City Point, which has a Century 21. Peruse the racks of designer clothes at deep discounts in this department store. For those searching for stocking stuffers or cool goody bag gifts, you can't miss a trip to Flying Tiger, which is also at City Point. For a trip into shopping history, head to the iconic Macy's on Fulton Street. The art deco structure was originally Abraham & Strauss. It's now undergoing renovations, but it's open to the public. For a deeper look into the history of the building, read a recent non-fiction book about the historic department store. After you've finished your shopping spree, you will have plenty of dining options. Fulton Mall is home to an outpost of the popular Shake Shack. You can find almost every fast food chain in the area, but you might want to hold off of those eats because there are tons of first-rate food in the area. Be sure to allow enough time to explore DeKalb Market Hall, which opened to the public in spring 2017 as "notably one of the largest food halls in the country, offering a distinctly Brooklyn point of view." The 33,000-square-foot space is home to almost 40 local and regional food outposts including The Arepa Lady, Steve's Key Lime Pies, Wilma Jeans, Hard Times Sundaes, Ample Hills, Bun-ker, Wilma Jean, Fulton Landing Seafood Company, and Katz’s Delicatessen’s where the famed deli will expand and open its first new outpost after decades at the Lower East Side location. If all of this food isn't enough for you, DeKalb Market Hall hosts daily entertainment programming in its two dedicated spaces: a custom-built show kitchen and an event space, DeKalb Stage, as well as a 40-foot bar designed by Brooklyn artists. Serious home chefs will love the nose-to-tail grass-fed butcher, a fishmonger, an artisanal cheese counter and an on-site bakery. After you've had your fill of good eats, see a flick on the oversized screens at the Alamo Draft House. If you like to dine while you watch a movie, the Alamo Drafthouse has a great menu or eats. If you're in search of a bathroom, you can always sneak into a Starbucks, but you can also find one in City Point. Almost every subway line goes to Fulton Mall. Take the subway (A, C, F R) to Jay Street/MetroTech or the 2 to Hoyt Street, or the G to Hoyt Schermerhorn. There are also multiple buses available. Enjoy a stroll through quaint Brooklyn Heights, which is a short walk from the Fulton Mall. You can also head to a game or a show at Barclays Center or BAM, both are walking distance from this centrally located shopping center.